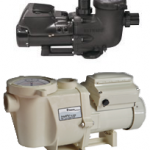 Pentair and Hayward have recently earned Energy Star certification on their line of variable speed pool pumps. This is a big step for both companies and the energy star certification further demonstrates the benefit of variable speed pool pump technology. To have this seal of approval from the EPA and Department of Energy, the variable speed pumps must show they are 30-72% more efficient than the traditional single speed pump and they most clearly are. I can attest to the significant energy savings these pumps bring and we’ve been installing them since their conception with fantastic results, saving customers anywhere from $30-150 each month on their utility bills. Pentair’s IntelliFlo VS Variable Speed Pool Pump and Hayward’s EcoStar are just a couple examples of variable speed pool pumps that have recently earned the Energy Star certification. Feel free to contact us for more information about how you can save money on your electric bill and keep your pool and spa looking great with Variable Speed Pumps technology!